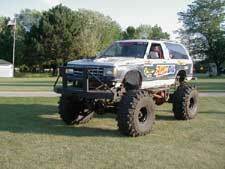 Underground Off RoadersOur group, the Underground Off-Roaders, is a world wide off-roading group. I was introduced to AMSOIL products by professional racers that really put your products to the test, and have always come out on top!! Which in turn has made me become an AMSOIL Dealer and a religious user. When people on the trail see my blazer they comment, "there's the AMSOIL Super S-10 Blazer," as I pull them out of the mud hole they are stuck in. I swear by AMSOIL and the rest of the mudders are beginning to see why!